A few weeks ago Zach, Jordan and I went to Florida where Jordan served an LDS mission, which was cut short–and sudden–due to medical issues and it all felt a bit unfinished. Lack of closure and all. So when I found tickets for $247 round trip from Utah, I knew we needed to go. 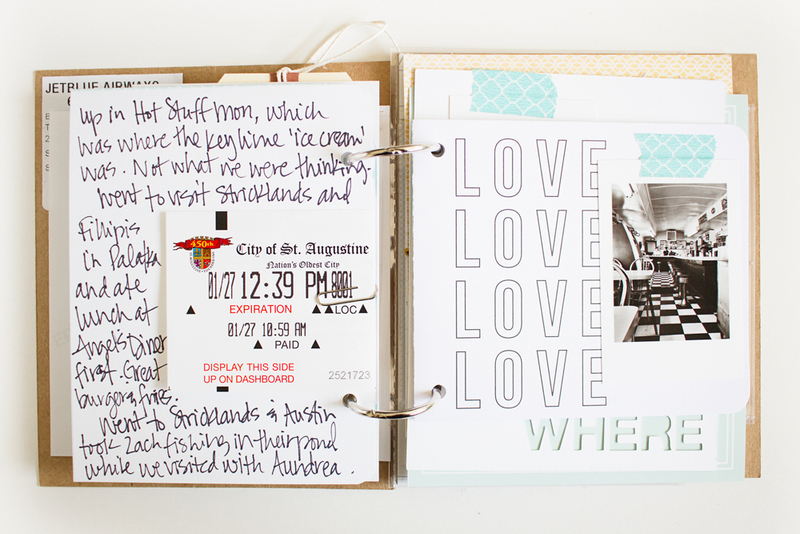 For the trip, I knew I wanted to make a little travel journal, in the truest sense of the word journal. 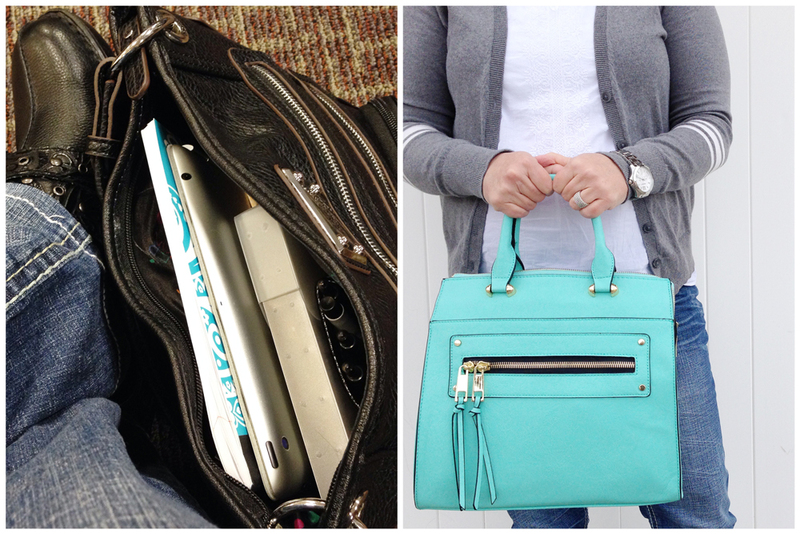 I wanted to quickly document our day-to-day happenings without worrying about a ton a photos. I was out to capture the trip in words so that I could create an actual album later with the mass amounts of photos I’d take. I took my Instax camera with me and would take one or two photos that day as a little reminder of the moment to put in my journal. Of course, I opted to include a few more ‘Instax’ style photos taken from my iPhone using the Snapshots #3 kit after the fact as well. 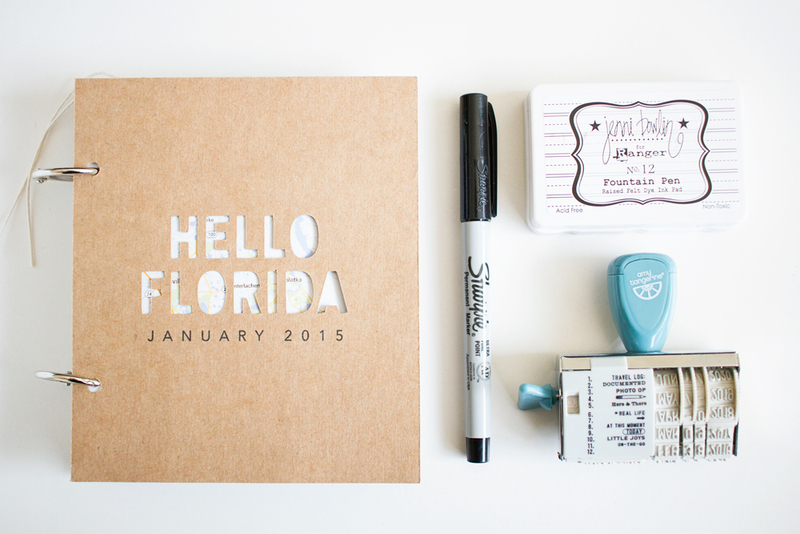 My supplies consisted of a sharpie, a date roller stamp, some clear travel-themed and date KBS stamps (Travelogue, Wanderlust, Time Again), a stamp block, black ink, two washi tapes, some paper clips and some enamel dots. I wanted to keep it all simple. For the album, again, I wanted to keep it simple, yet have some fun. So it was all about the pages. 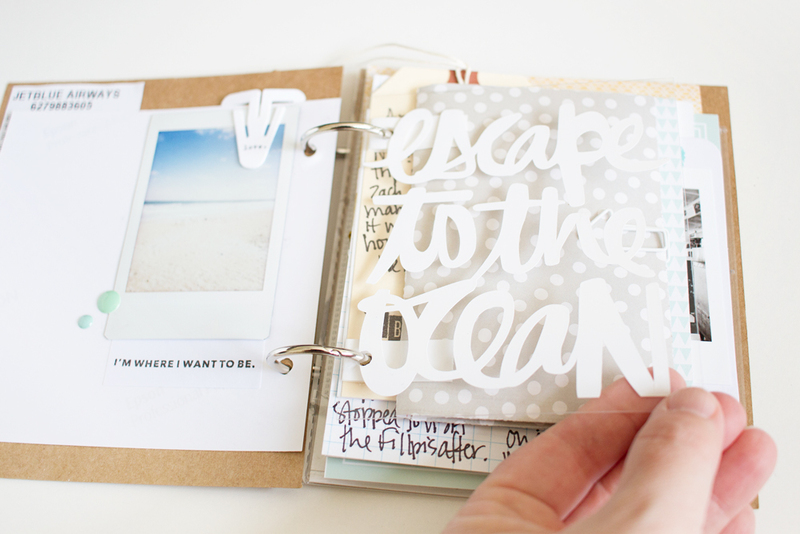 Different pages in different sizes, mediums, cuts, etc. And when it came time to package it all up, I looked around to see what I could find to put it in. I thought about various boxes or containers, but nothing seemed to fit the bill. Then I glanced down at a box of stuff and saw a Making Memories elements container and could not believe how prefect it was! I seriously could not have planned it better myself. I just put the rest of my accoutrements in a ziploc sandwich bag and tossed them in my purse. Of course, I went out with the ‘left’ and came home with the ‘right’. ;) But still perfect on both counts. I love it when a plan comes together. So here’s a look at the whole enchilada. 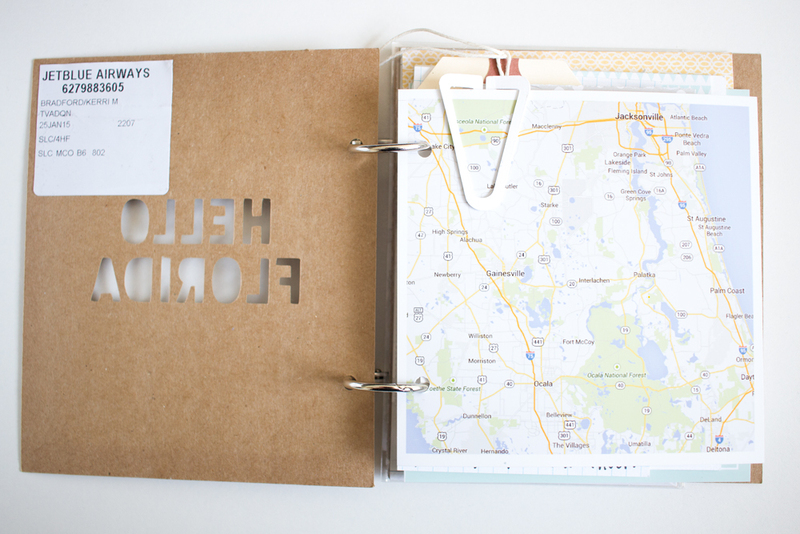 The album itself is 5″ w x 5 3/4″ h. It’s a print and cut made from a kraft paper. It’s heavier than paper but not as thick as cardstock. I love this stuff! Kass bought a pack of it at Hobby Lobby for a project and I’m gonna have to buy her some more because I keep stealing it. I also love, love, love including maps in vacation albums. I love a visual reference for me or anyone looking at where we were. I took a photo of the beach with my Instax, but if I remember my instructions correctly, you’re suppose to use it in above 50 degree temps. It was windy and cold on the beach, so I think they struggled to develop. But still, it kind of produces a fun effect here. 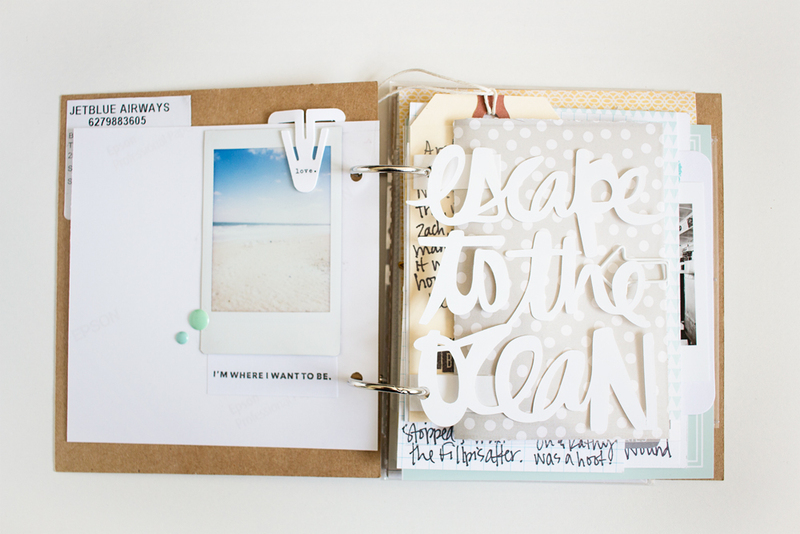 I also used a print+cut tab from Attach It on the photo on the left with Escape to the Ocean cut from vinyl and adhered to a plastic sheet on the opposite side. All cut before hand and taken with on the trip. I wanted to include at least one envelope for my album to house itty bits of paper, so I used this double sided envelope from the Envelopes kit, cut it as large as I could on a 12×12 paper, and guess what. 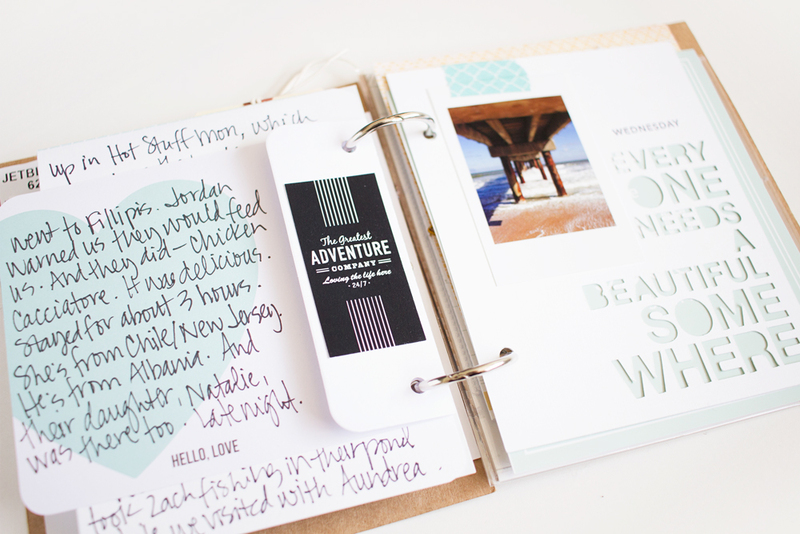 It was perfect for holding Project Life cards and other fun things. I also took two pieces of cardstock with good adhesive to use as a binding for the album. 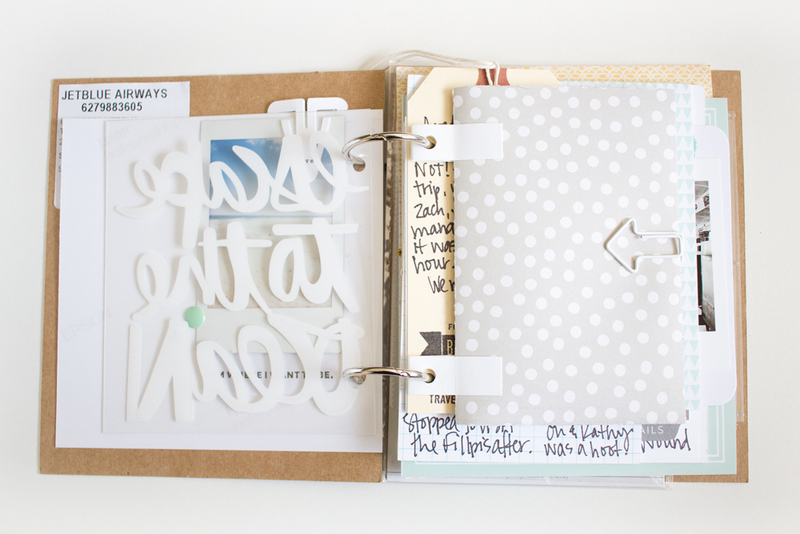 Tags make awesome pages in a mini album like this! Since eating gator tail was a monumental occasion, I included a photo of this when I came home. Used Snapshots #3 for that. I’m in love with that kit! I backed some cards with grid or lined paper. I just have a notepad of that stuff–grid on one side, lined on the other. It’s good stuff. Used a receipt image form inFORMS to make this left page. Colors are editable so I could make it match my album. 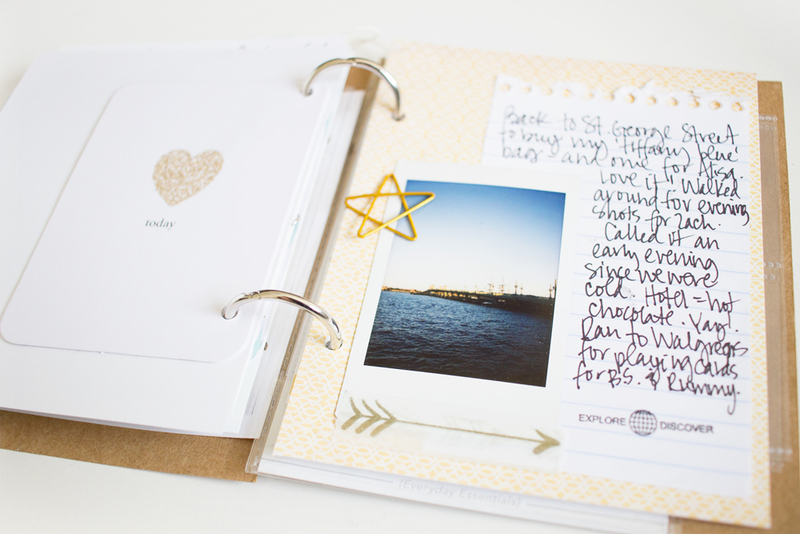 I also used shimmery gold striped Project Life card from Teresa Collins. I think this is one of my favorite pages. :) Love the Foldover. 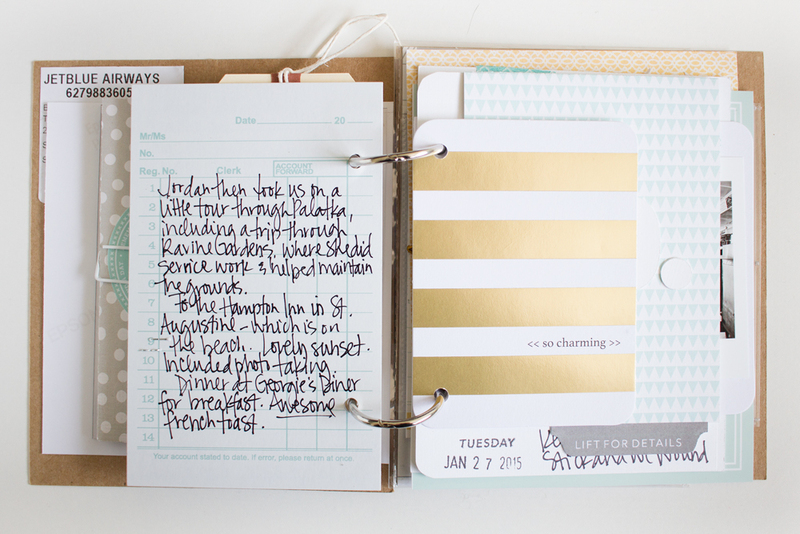 It’s just a fun way to extend your journaling and add a little flair. 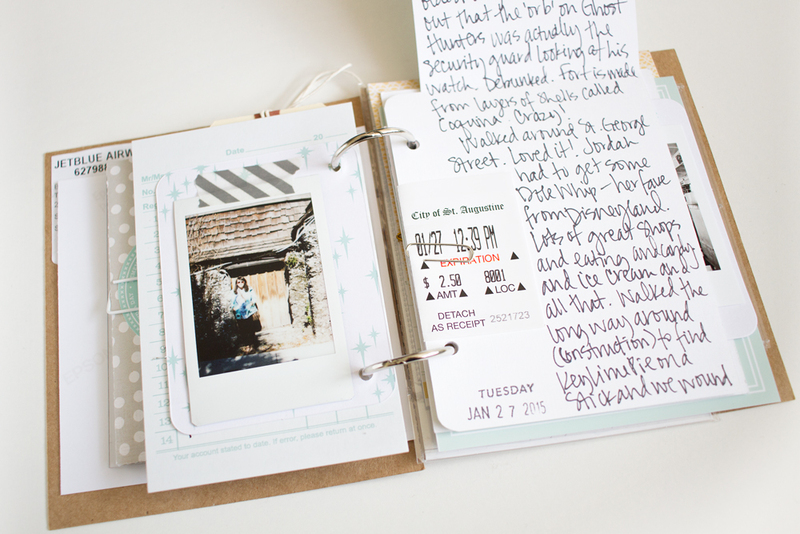 Adding receipts with dates and locations on it is the perfect ephemera for any album. Wrapping it around gives ya a two-fer accent. Sweet. Like I said, it was all about the page content and what I could do to make things easy…most of the time, anyway. ;) So I used another Teresa Collins card–this time a 4×6 one–and folded it to make this page. 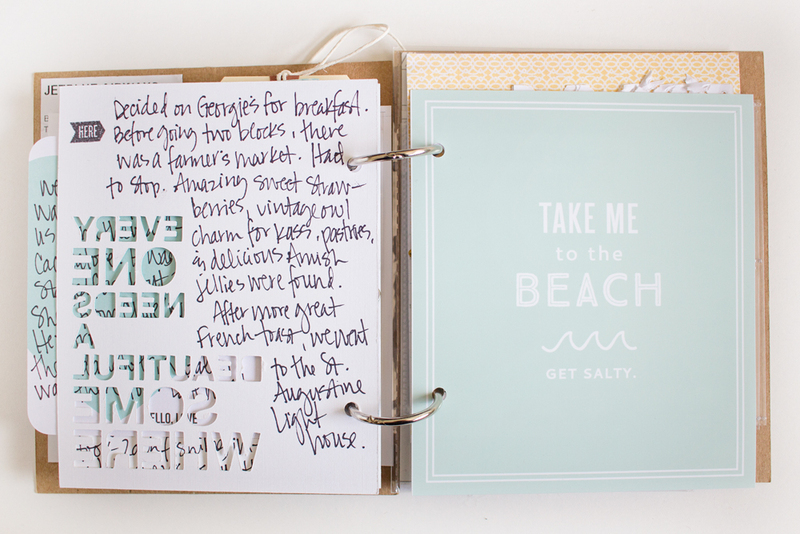 And then on the flip side, I wrote journaling and included a tag from Tiny Details that I already had printed. It just happened to fit perfectly there. I also cut the right page using a card from Beautiful Somewhere. I love open-space cards! 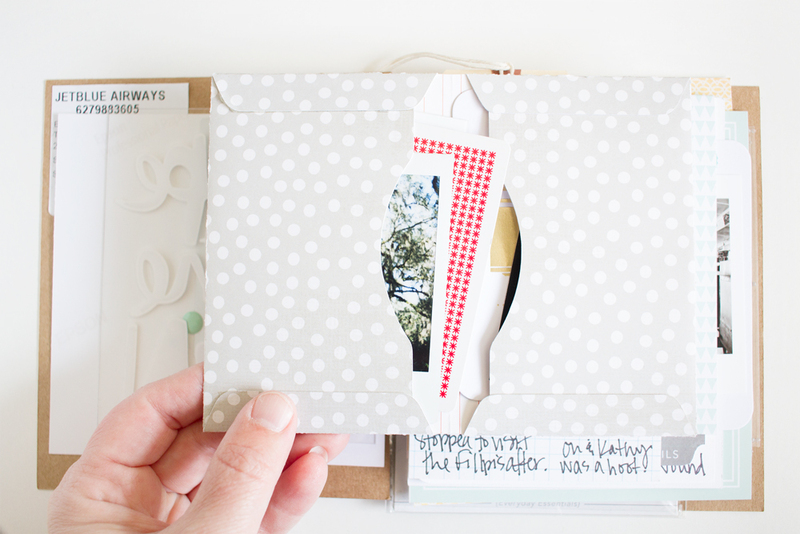 Another page modified from a card in the Beautiful Somewhere kit. Makes a great statement page all on its own. I did add a Freckled Fawn star paper clip and arrow washi tape after I came home…because…well…how could I not? And I loved the Teresa Collins glittery heart. 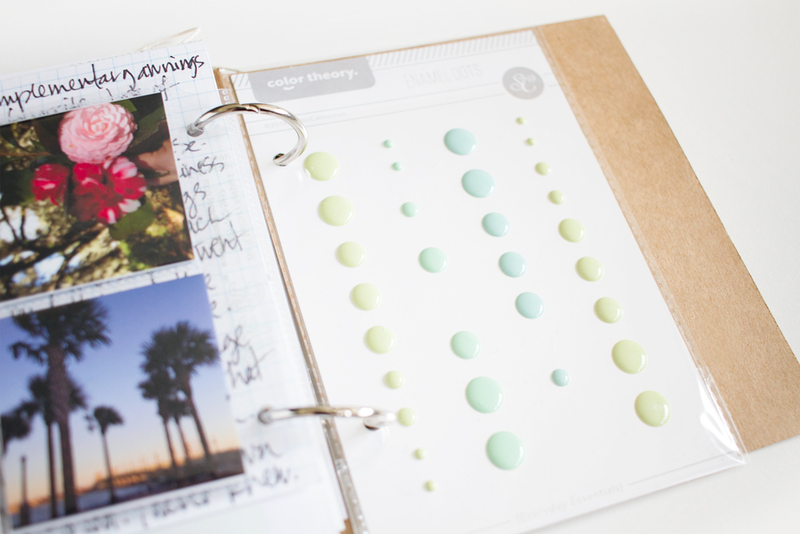 And then last, but not least, these Studio Calico enamel dots were the perfect accent to bring along–and the perfect size to punch holes in and keep in my album. I didn’t necessarily keep the album in its original order. I switched pages around as I needed. Using rings–something changeable–made this kind of project so much easier to do. I also added a few items or photos at home too. Just some finishing touches and all. I just love this! I have waiting to see how this album turned out and of course, it is fabulous. Thanks! This is the bomb!! What travel stamps did you take with you and what stamp did you use for the Ate This?! So, if I understand correctly, you took the basic elements for your album with you on your trip? I have been on the fence re: whether or not to get an Instax camera. 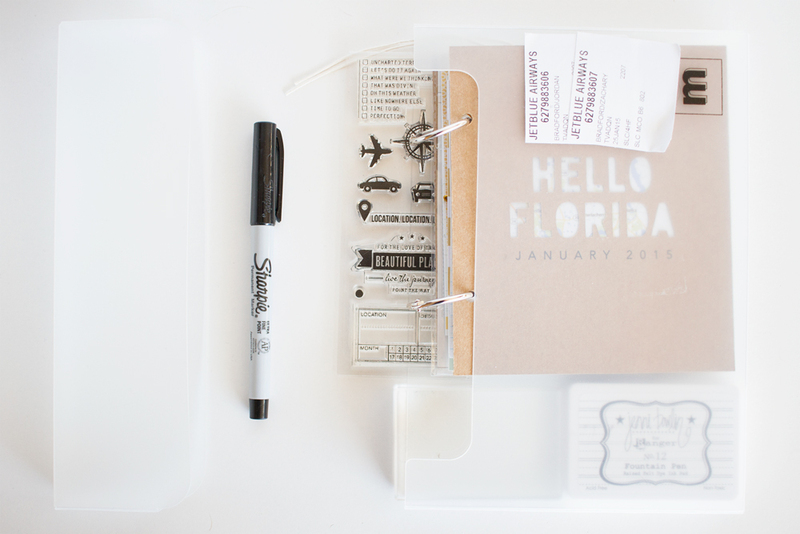 I know they are all the rage right now, but after seeing your Florida album and photos, I think I am leaning towards getting Snapshots 3 and printing on a good printer. 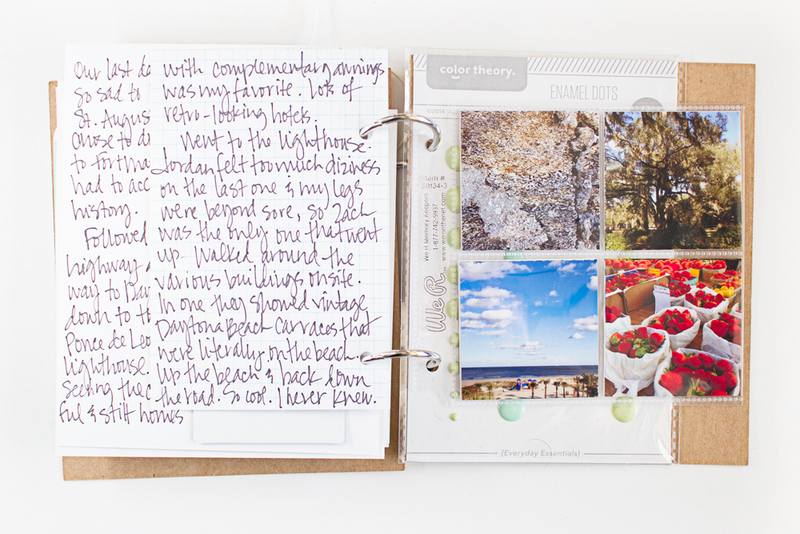 The colors on the photos are so much richer – and won’t fade nearly as fast an Instax photos. Love the album! Wow! That is a fabulous album! Was wondering what stamp set you used and the font used for the cover both the cut outs and the black print – this mini album is amazing! I am going to Florida this summer and I want to make one similar to this one. The cover is the best! LOVE LOVE LOVE the album!! 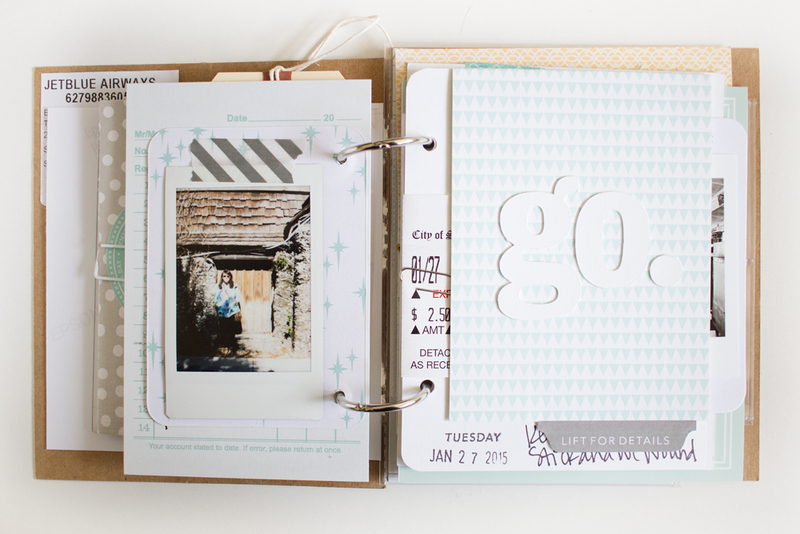 Such great ideas and great ways to use your amazing kits! 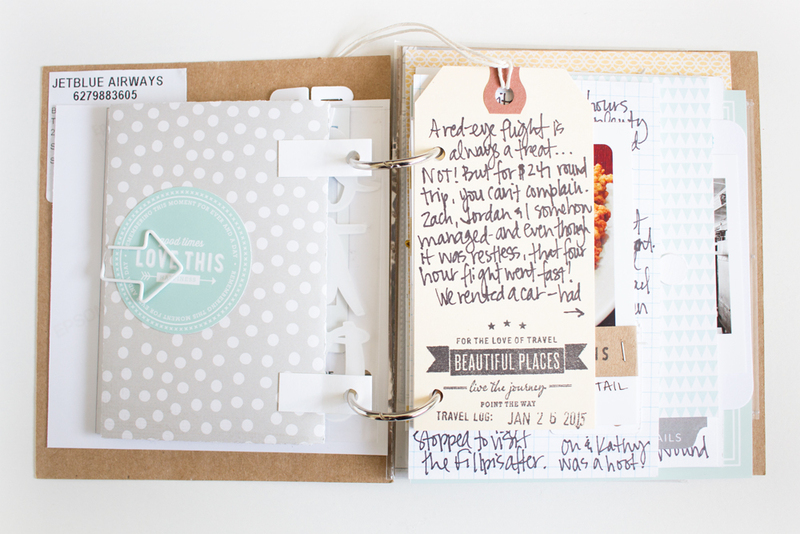 Thanks so much for sharing….planning on scrap-lifting this! LOVE!!!!! This is such a stunning mini album! I want to copy the whole thing! Sorry we didn’t get a chance to meet up for coffee. Next time you are in town, it’s “my treat” at the Chocolate Turtle!. FABULOUS! 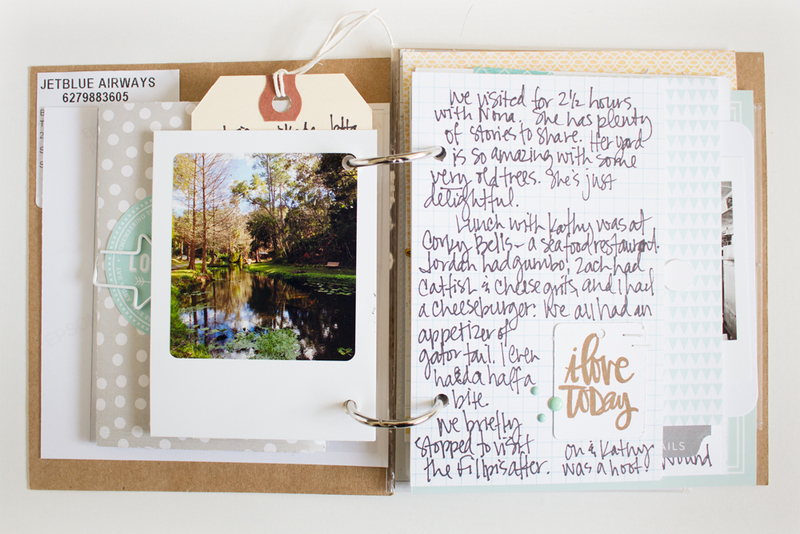 Love all that journaling! I absolutely LOVE this! 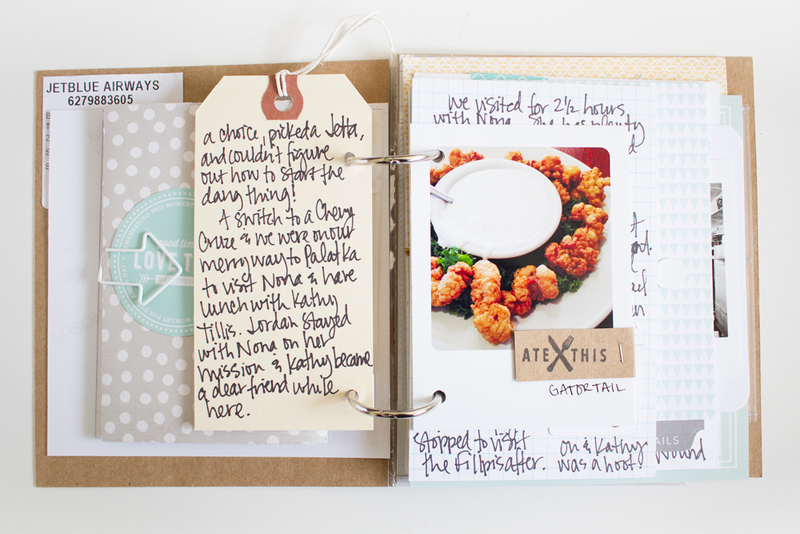 I also make my own journals and just love how you’ve done this one. Am going to steal some ideas.